Did Preacher Just Defeat the First Season's Villain? Yes. In last night’s episode of Preacher, not only was it made quite clear who this season’s big bad guy would be, but Jesse Custer actually defeats him. So, uh... what’s going to happen in these remaining six episodes? “Monster Swamp” was probably the slowest one yet but that didn’t mean it wasn’t filled with big revelations, the primary one being the aforementioned villain character, Odin Quincannon, which we could have guessed when we saw Jackie Earle Haley playing him. Since the beginning, Odin has mostly been a tangential character but right from the start here, it’s cemented that he’s terrible. His employees hunt the town’s hookers for fun (to actual death). When presented with a new business opportunity, he literally pisses on it. And the only way Jesse gets him to come to church is to make a bet with him: Jesse’s father’s land versus Odin’s faith. That’s when, just when it couldn’t be any clearer that Odin is the worst person in Annville, Jesse uses his power to convince him to serve God. Does that mean Odin will become good? Or will he take his new directive in a twisted, literal fashion? We do not yet know. We just know that his threat has been neutralized, and at the moment, there’s no indication of how Odin will bother Jesse or the residents of Annville ever again. We also know is Preacher is not as interesting a show when it’s not about the three main characters. The sections of this episode which focused on not just Odin, but the Mayor and others, just don’t have the same vitality. Jesse and Cassidy talk angels. Kind of. Hell, it’s even there when Cassidy tries to explain the angels to Jesse, and casually mentions they’re inevitably going to end up having to go on a road trip. “You gotta know where this is headed,” he says—a throwaway line to most, but realizing that the Preacher comics begin with Cassidy, Tulip and Jesse hitting the road together, it’s an exciting bit of foreshadowing for what’s to come. Fiore is about to get a wake up call about what’s not in that can. Still, Preacher’s most intriguing subplot belongs to the angels Fiore and DeBlanc. They have their hilarious scene with Cassidy, reveal they have a phone to Heaven, and consider calling it for help. The problem is they’re on Earth without permission—which makes it terrifying and tremendously exciting when that phone start ringing in the episode’s final moments, it’s so scary yet exciting that the phone from Heaven is ringing. 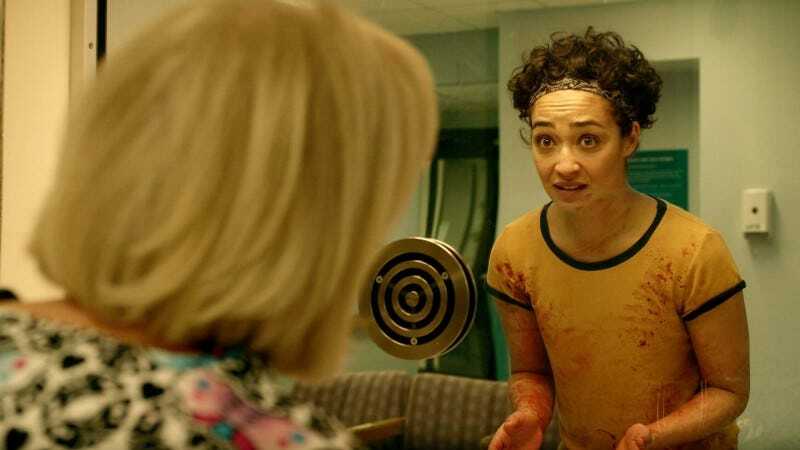 Despite being the fourth episode of the season, “Monster Swamp” feels like the close of a major chapter in Preacher’s story. Jesse has his power. Tulip and Cassidy are caught up. One villain is down (but for good?). Most important, Heaven knows something is up,. Most there’s likely going to be hell to pay... now we have to see who’s going to pay it.